So, Brandin released an ADORABLE video on Friday. The new products are finally shipping out. Check this out! And now for the really fun news! 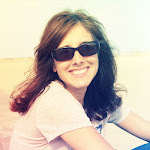 I have another awesome giveaway to share with you today! You could win a $500 Webster's Pages shopping spree and have your work featured on the blog. How awesome is that??? All you have to do is head over to the blog and read the details. But do it quickly because they will be sharing the winner on Monday! Here are a couple of my latest WP projects. I used Palm Beach on both of them. This first little tag uses some of the trims in a unique way. 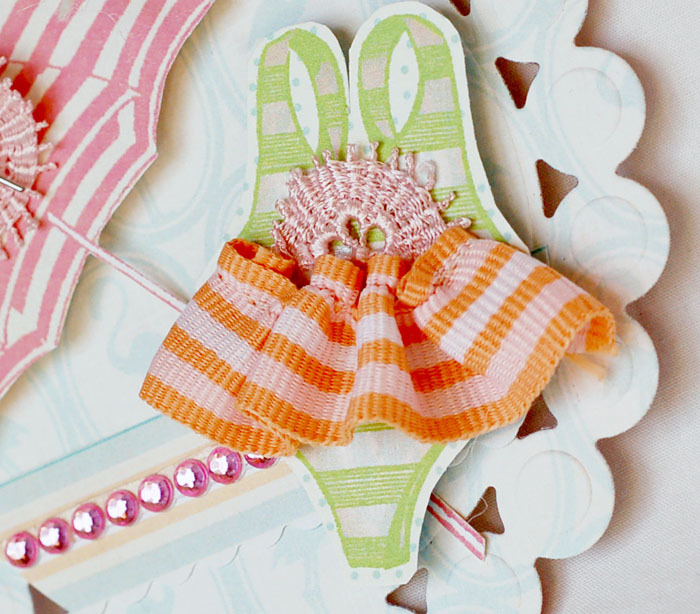 I ruffled the orange striped ribbon and made a bathing suit skirt out of it. 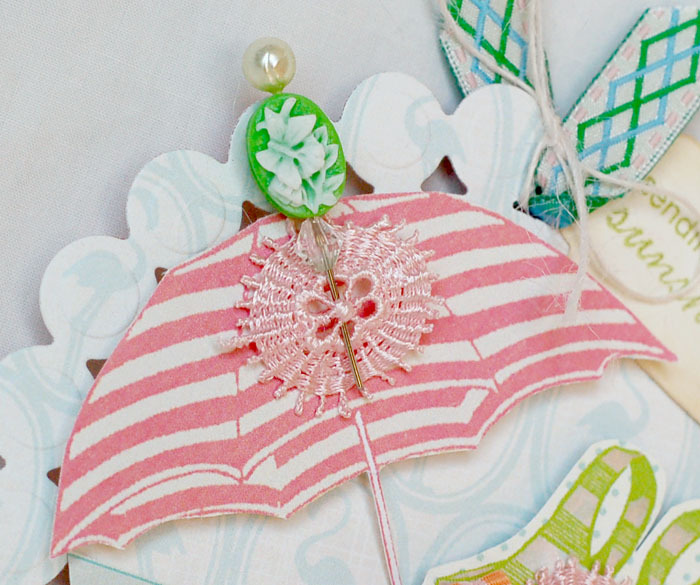 I cut the pin down, added a piece of doily trim to it and made the umbrella topper. I added the doily trim as another embellishment on the swimsuit. This next page is about how much I miss Maui. I dream of going back every single day! It's truly my favorite place in the world! 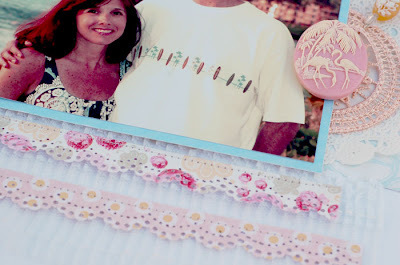 I used one of the new Palm Beach silhouettes and a doily. So, are you in a summery mood yet? That's definitely the feeling that this line gives me. That's it for today. Thanks for stopping by and good luck with the giveaway! 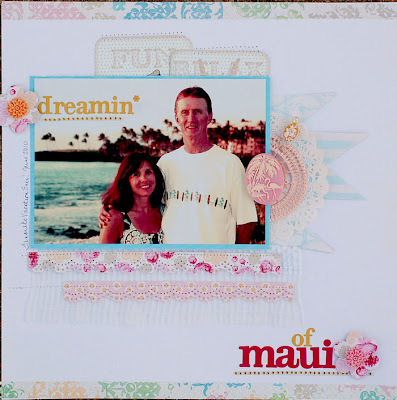 Thanks for sharing the giveaway, and the Maui layout is gorgeous! Love the pink. Hi Annabelle: I love what you did with the Palm Beach line. God has given you a wonderful gift, and I'm SO grateful that you use it to bless us all. 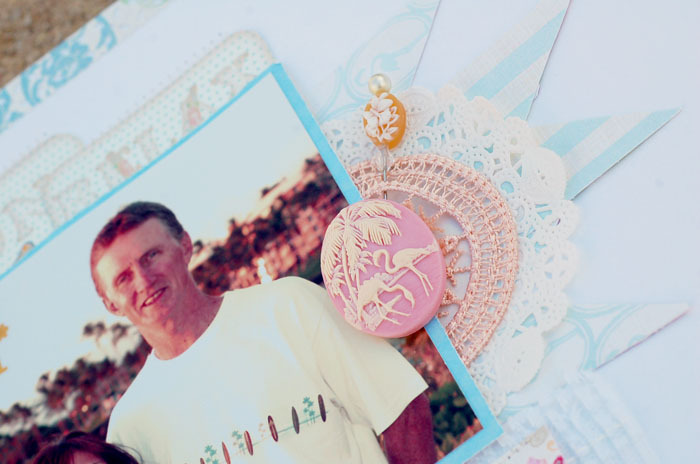 You inspire me, and SO many crafters. I did go to the link, posted the video on my blog, and on my Facebook page. I'm happy to do it as Webster's Pages is such a lovely company. Thanks again for all your inspiration. You really bring the sun into my house with these gorgeous creations:) I absolutely love your layout and card! I love your Webstere's designs! That little umbrella fits so perfectly in the doilie shape. Such cohesiveness! Wow - LOVE both of these! Great job Annabelle! Thank you for this giveaway - and good luck to everyone. you are amazing my friend, the tag and layout are just so gorgeous!! What beautiful projects, Anabelle! LOVE that tag! Such a fun shape and such an adorable scene. The little bathing suit is just the sweetest thing evah! Love your page, too. Maui is fabulous. Would love to go back there again myself. Cute layput! Wow this book looks like fabulous fun! Sneakers are the ever popular type of shoes among men and a lot of men make the mistake of wearing athletic looking sneakers with their jeans. Every business nowadays strives for prominent online identity. Least to say, commencing an online business is of no use until one gets noticed by the targeted audience.